Some big news for our team! We were just notified that Prime + Proper, the signature steakhouse in Downtown Detroit that we were fortunate enough to have the opportunity to design, won best design for 2018 in its category (check average more than $50). We’re thrilled that this landmark project is getting the accolades we feel it deserves! 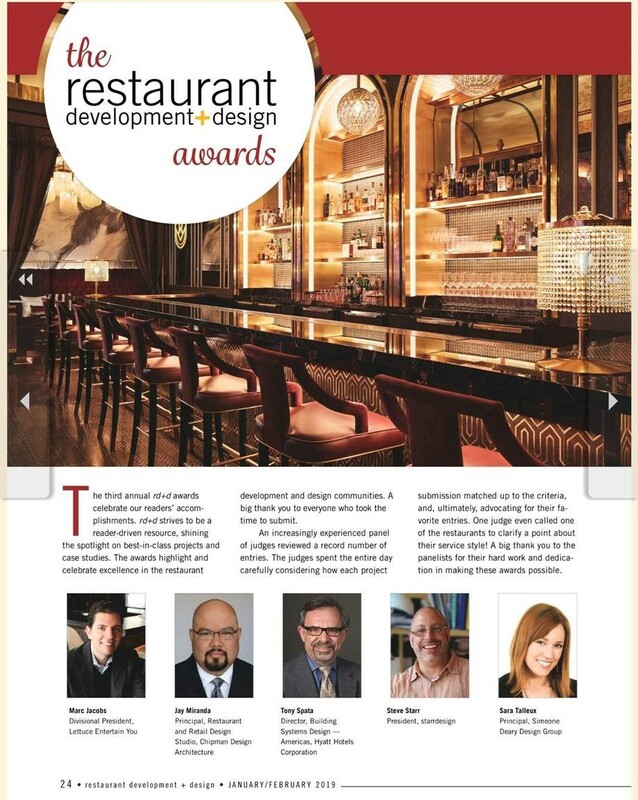 Thank you to Restaurant Development & Design Magazine for this wonderful honor. GLCD project Anti-Hero announces Executive Chef! Working Class Outlaws, opening Anti-Hero this fall in Ferndale, has decided on the Executive Chef for their new location. Los Angeles-based chef Nick Erven is set to take the helm at this exciting new location. We are lucky to work with such an awesome client, and can’t wait to try Chef Nick’s food! Celebrity Chef Marcus Samuelsson in Detroit! In what can be taken as yet another indicator of the momentum behind Detroit’s culinary resurgence, Celebrity Chef Marcus Samuelsson held a round table discussion at the Gem Theater in downtown Detroit. The focus of the discussion was the shortage of skilled labor and what is needed tofind success in such a competitive industry, both locally and nationally. The work force in Detroit, long known for being “blue collar,” has not disappointed. An extremely diverse group of locals fill all kinds of positions in our local eateries—and their influences on service, menus, beverages and culture are easy to see. GLDC well represented in Eater Detroit's monthly "Heat Map"
We absolutely have passion for what we do, and do it because we love it—not for notoriety. Still…C’mon…it’s fun to toot your own horn every once in a while! On the latest list on Eater Detroit’s monthly “Hottest Restaurants in Detroit” list, we’re proud that 4 of our projects are on the list! Nothing makes us happier than seeing our clients find success on their terms. We know how fortunate we are to be able to play a role in this incredible culinary resurgence in and around the city of Detroit. We're proud to be from here. Proud to work here. Do yourselves a favor and check them out immediately! Owned an operated by the team from Grey Ghost (and sitting across the road on Watson Street), Second Best Bar is going to change the expectation of the "modern dive bar." In this space, you can enjoy high end craft cocktails prepared by some of the cities best mixologists, while seated next to a customer sipping a Strohs bohemian. GL Culinary designs filled a very small, constrained kitchen with high end equipment to accomplish a cutting edge small plates/bar food menu. If you've been to Grey Ghost, you know what to expect from the culinary team. The curved bar design is a throwback to the horseshoe dive, but filled with preferred equipment of the mixologists at Grey Ghost. A stones throw from Little Ceasars arena, this space is likely to become ground zero for pre and post event partying in Midtown. Come as you are. Fill your belly. Sate your thirst. Bring quarters (because the best game of all time, dome hockey, sits in the space). Kuzzo's Chicken & Waffles--Kool-Aid on Draft! Again, we're lucky enough to be a part of something, as far as we know, very unique! Kuzzo's serves their guests a ton of Kool-Aid that pairs beautifully with their phenomenal cuisine. As you can imagine, this creates some serious back of house complications with batch-making Kool-Aid in large quantities--the mess, the space, the chance for spills. We'll be first in line. I'm partial to red. What an incredibly unique design feature we're lucky enough to have a hand in--the folks who a reopening the historic St. Clair Inn on the Detroit River in St. Clair, MI have decided to be bold. In their river side pub, they declined to go for the traditional back bar that can be found in almost every bar in the country. Instead, they a building an all glass, refrigerated craft beer display cooler to serve form and function. SheWolf to open this Friday, 6/29/2018! After taking a large, open space within a residential building and a vision, SheWolf Pastificio & Bar is ready to take Detroit by storm with true, authentic Italian cuisine! Get ready to say buongiorno to Detroit's newest dining hotspot. SheWolf – a reference to the Roman origin myth – is thought to be the only chef-driven restaurant in Michigan milling its own flour on-site fresh daily for its pasta and bread. We had a blast on this project and wish the SheWolf team much success!